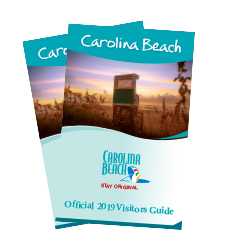 Wilmington, NC - The Wilmington and Beaches Convention & Visitors Bureau is pleased to announce that Carolina Beach was honored during the 2016 WRAL Out and About Voters’ Choice Awards on Tuesday, August 2nd at an awards ceremony in downtown Raleigh. WRAL is the NBC affiliate that serves the greater Triangle market in North Carolina. Awards were divided into five main categories: Cuisine, Experiences, Lifestyle, Nightlife and Southern Experience. The Experiences category included a subcategory for “N.C. Beach Destination.” After the votes were tallied, Carolina Beach took the #3 spot. According to WRAL’s website, thousands of votes were cast by readers during a month-long nomination period. The final ballot features five finalists, which were selected based on the number of nominations they received. Write-in options were also accepted on the final ballot. The top three vote-getters in each category were recognized at the awards ceremony. For the full list of 2016 WRAL Out and About Voters&apos; Choice Awards winners click here or to learn more about the awards click here. The New Hanover County Tourism Development Authority d/b/a Wilmington and Beaches Convention and Visitors Bureau is the official destination marketing organization of New Hanover County which stimulates economic development through the promotion of travel and tourism: www.WilmingtonAndBeaches.com.